Lulu is having a Columbus Day Weekend Sale. You can get 14.92% (clever, eh?) off any order by using the code EXPLOR305. That means, for the mathematically disinclined, that you can get a softcover copy of Comic Book Fanthropology for $14.42 and a hardcover version for $25.48! The code is valid through Monday, October 11, 2011. Order here! 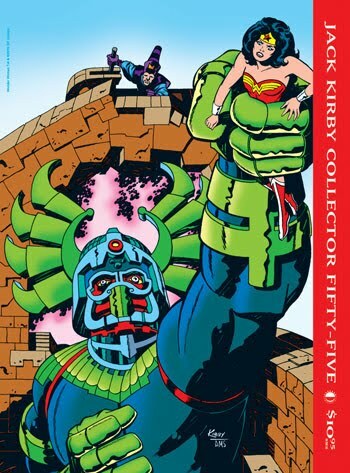 At the tail end of the month, Jack Kirby Collector #55 will hit the stands. It's actually scheduled for October 27. My "Incidental Iconography" article looks at the villains of the old Thundarr cartoon, and there's some really cool character art sketches for the series which I'm pretty sure haven't been published before! Somehow my timing was spot-on as Warner Brothers just released the entire series on DVD! Call me a trend-setter! The one other thing I want to plug hasn't formally been announced (and it's not my baby so I can't really do that here) but if you're dying to get the COMPLETE collection of my published writings, swing by Booth #2641 at New York Comic Con this weekend and talk with either David or Steve. Tell them I sent you, and they'll help hook you up!